Baton Rouge, a quiet college and government town, was already reeling from catastrophe when the rains began to fall. Just weeks before, the city faced protests over the police shooting of Alton Sterling. Then the killing of three of the city’s police officers shocked the nation soon after the slaying of the police officers in Dallas. The epic flooding hit an already distraught community. The flooding in Louisiana counts as the nation’s worst natural disaster since Hurricane Sandy in 2012. 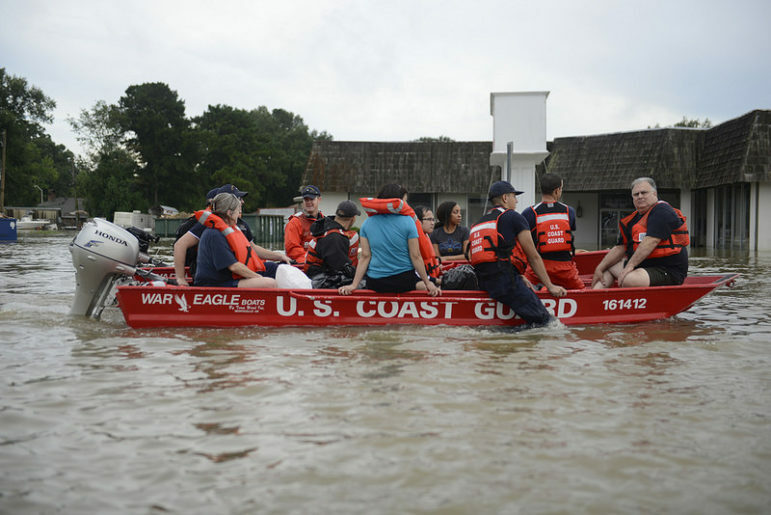 It killed 13 people, damaged more than 110,000 homes, and caused more than 106,000 residents to register for assistance from the Federal Emergency Management Agency (FEMA). More than 7,000 people are in 37 shelters. Twenty inches of rain fell in some areas in only 24 hours. Louisiana State University’s campus is closed, and the schools will not be opening next week. Volunteers constitute about 90 percent of the American Red Cross workforce that responds to nearly 70,000 disasters every year, most of them home and apartment fires. Volunteers are always needed. But the number one rule for anyone offering to help the flood victims, unless you are arriving on Air Force One, is to not self-deploy until a need that you can meet has been identified and your aid is requested. The Baton Rouge town paper, The Advocate, reported that when Capt. Clay Higgins, a reserve Lafayette city marshal who is running for Congress, showed up at one of the shelters, the Red Cross asked him to leave. The Red Cross has been responding to natural disasters for more than 100 years. Yes, they have rules and the general public needs to respect them because they are there to save lives. The messaging in a disaster, however, can be confusing. Air Force One landed yesterday to permit President Obama the opportunity to visit those whose belongings lie in a tangled heap. “I know how resilient the people of Louisiana are, and I know you will rebuild again,” Obama, dressed in a blue shirt with the sleeves rolled up, said after touring several homes. He pledged that the federal government would support the victims of the community for the long run. Louisiana Governor John Bel Edwards declared a state of emergency and said this past weekend that too little attention was being given to this natural disaster, perhaps because it was not the result of a hurricane or named storm. A more cynical view might be that the Olympic games and the presidential campaign captured the attention. Some $30 million in federal housing assistance has been approved for residents. An estimated 1,500 American Red Cross volunteers responded, though the agency was questioned about the speed of their response. The Louisiana Society for the Prevention of Cruelty to Animals attempted to rescue stray pets. Second Harvest Food Bank and the United Way of Southeast Louisiana distributed supplies and food. Singer Taylor Swift gave $1 million to the recovery effort. Local charities such as Cancer Services-Greater Baton Rouge are abandoning their major fundraising events to work together to raise money for the recovery effort. In New Orleans, 75 miles down the road, 2005’s historic Hurricane Katrina produced many local experts who are useful now for this new disaster recovery effort. They know the FEMA process for grants and loans, how to avoid being defrauded by contractors, and the do’s and don’ts in home-salvaging work. They are also determined to avoid abandoning thousands of people for years in “temporary” FEMA trailers. In this flood response, several officials said, FEMA is pursuing a strategy of getting people to move back as quickly as possible into at least one or two rooms of their flood-affected houses, an aim that would depend on quick payments and a work force of volunteers. “Our efforts to help the schools get back open and get as many people back in their home as soon as possible is going to minimize the effect we had after Katrina,” said Lt. Gov. Billy Nungesser, a Republican, who praised the federal response. There are also new organizations that came into existence following Katrina that will prove helpful, like the Louisiana Civil Justice Center that helps the poor navigate difficult legal issues. Crucial lessons, however, remain to be learned and acted upon. Save the Children issued the 2015 National Report Card on Protecting Children in Disasters, its first report since the formation of the National Commission on Children and Disasters in the aftermath of Katrina. The report notes that only 17 of the 44 recommendations put forth by the commission to address the gaps in federal planning that put children at risk have been fully met to date. Children remain vulnerable. NPQ, as you may remember, wrote in, “What Ails the Red Cross Looks Like a Perfect Storm of the Very Familiar“ that one of the concerns we would have about its current downsizing plan, which entails the closing of local offices, would be the loss of the critical-in-disaster intimacy held by local leadership and volunteers. After Katrina, the scarcity of a local presence in some areas was seen as a fatal flaw in the response, particularly in low-income areas. Finding creative ways for the Red Cross to regularly relate to local community leaders does not require an office.